Justin Trudeau continues to stand firm on his approval of Kinder Morgan’s Trans Mountain pipeline, as he made the media rounds in B.C. on Tuesday. 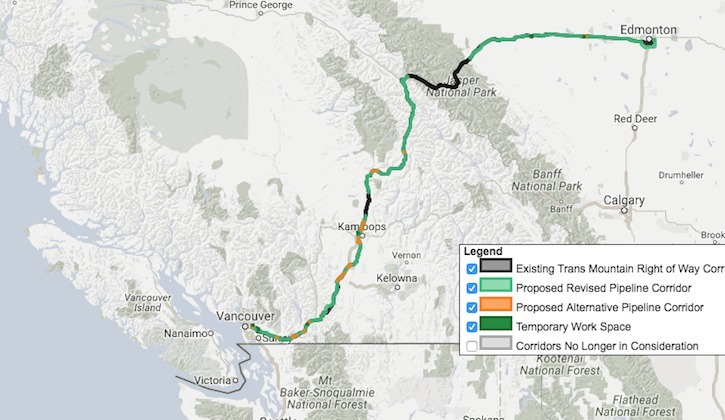 The tour comes a month after the prime minister announced on Nov. 29 that his government had green-lighted the $6.8 billion project, which will twin the existing oil pipeline from Alberta to Burnaby. Premier Christy Clark voiced her concern at that time, saying she felt that Ottawa needed to ensure that B.C. was getting its fair share for taking on so much of the risk, and urged the prime minister to visit B.C. to explain his decision. Alberta Premier Rachel Notley visited the province earlier this month to defend the proposal based on the number of jobs it would create. Rachel Notley pitches pipeline to B.C. Trudeau was set to visit several news outlets Tuesday to explain how he he felt Ottawa had balanced the need to grow Canada’s economy while also protecting B.C.’s coast. Trudeau re-emphasized the need for Canada to transition from fossil fuels to more sustainable fuel sources, saying that it would take time and careful planning – and that while concerns from all sides were being considered, the pipeline decision had to be made in the best interests of all Canadians. Earlier Tuesday, Trudeau met with provincial health officer Dr. Perry Kendall on the illicit drug overdose epidemic that has claimed 755 lives in B.C. this year. “The fact is there is no one magic bullet that’s going to fix this situation,” he told the editorial board. “Harm reduction is a piece of it, maybe prescriptions for opiates might be a piece of it.” He said he remains focused on a federal mental health strategy.